Professional Patios & Screenrooms, Inc.
Where quality work is job one. The materials we use are made to last and handle the Gulf South environment for years to come. Our installation crews are top notch, customer friendly and aim to please on EVERY job. From the moment you contact us we’ll handle your project with professional care and quality from start to finish. We love projects that are unique and a challenge. Let our Pro’s make your vision come to life!. "Choosing Professional Patios & Screen rooms was one of the best decisions I ever made. The workmanship is excellent. I honestly could not find any imperfections whatsoever. I was very well satisfied with the quality and overall performance and enjoy countless hours under my patio cover. I would recommend Professional Patios & Screen Rooms to all my family & friends. Thanks so much for the fine work you've done." "My husband and I are extremely pleased with the patio you installed on our property. It is first rate, quality and workmanship. It is refreshing to have a relatively young man who knew so much about the business and wasn't afraid of work. You did not subject us to any hard 'salesman's pitches' either . . . We will gladly recommend you to anyone. Thanks for a great job." "I was very pleased with the wonderful job you did on my patio, I decided to write this letter to formally thank Professional Patios & Screen Rooms for a job well done. I was truly impressed with your work, and my patio was completed as scheduled. The products used were very good materials and the warranty was great. My neighbors were very impressed with your work and even more impressed with the price. My family and I have really enjoyed our time spent relaxing and cooling off on our new patio. 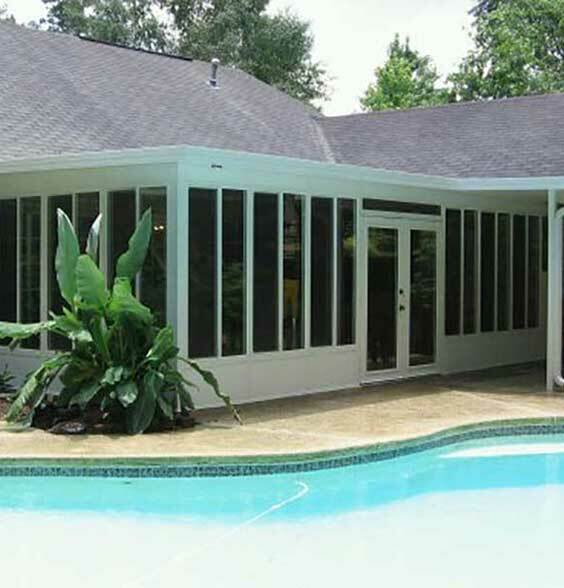 I will recommend Professional Patios & Screen Rooms to my friends and relatives." "The room is lovely - please thank Rodney and his men. I know we will have lots of enjoyment in it." "Just a note to say that I'm very pleased with my screened patio. The workmanship and finished product is excellent." "I would like to express my thanks for a job well done. The installers were extremely efficient and well organized. They even cleaned up when they were finished! I would not hesitate to recommend Professional Patios to anyone. Thanks again." "Your office kept us informed all along the way from estimate until job completion. Very unusual with most construction work... Everything was done to our satisfaction. We are pleased with a job 'Well Done.'" "It's perfect! The crew was first class & friendly - I would be happy to recommend you guys to anyone." "Thank you very much. Well satisfied. Your name, "Professional" Patios fits perfect!" "Our Patio looks even better than we had anticipated. Everything went exceptionally well and we are completely satisfied. You're all very professional!" "The whole staff of your company did an outstanding job. I will recommend ya'll to my friends in the future." "A great company and very pleasant people to work with. Work performed was professional." "We are very pleased with the outcome of our vinyl window enclosed patio. We give the company an excellent rating." "As a business owner myself, I greatly appreciated the courteous customer service and quality workmanship. I would highly recommend you to anyone. Thanks!" "You all are deserving of the name Professional Patios as everyone on the job was just that. Keep up the good work and we will pass the word."